We have a lot of data to support the claim that the Axis of Gold exists and is gaining strength. We know that for example, Russia has tripled its gold reserves in the last ten years. It’s gone from about 600 tons to over 1800 tons of physical gold, and is moving very quickly towards 2,000 tons. That’s an enormous amount of gold. China is also amassing physical gold at an astounding rate. Like Russia, it has tripled its gold reserves, officially from 1,600 tons to 1,800 tons. But we have very good reason to believe China actually has a lot more gold than that. China might actually own up to 4,000 tons of physical gold. We don’t know the exact number because China is highly secretive about its gold acquisitions. But that’s a reasonable estimate. China is also the world’s largest gold producer with mining output of about 450 tons per year. Iran also has an enormous amount of gold. Iran received billions of dollars in gold from the Obama administration as bribes to join in the now discredited nuclear deal (the “JCPOA” or Joint Comprehensive Plan of Action) to limit Iran’s nuclear weapons program. 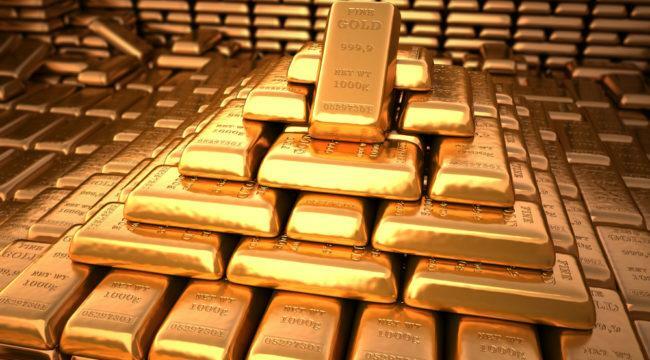 Iran has also received gold imported from Europe via Turkey, but the exact amount is unknown. We don’t have any insight into how much it has because it’s also highly nontransparent. But in the first quarter of 2018, Iranian gold bar and coin purchases more than tripled. Turkey is also acquiring enormous amounts of gold, which should not be surprising given Turkish president Recep Erdogan’s recent comments questioning the role of the dollar in global trade. The Turkish central bank has almost doubled its gold holdings since last May, according to the World Gold Council. And it was the second largest buyer of gold among central banks for the first quarter of 2018. So that’s the Axis of Gold. Again, evidence for this Axis of Gold is overwhelming. I have contacts in the national security industry community who have, in their own roundabout way, been able to confirm that to me, so it’s very clear that’s what’s happening. This is the type of information you don’t see in the headlines. This is very granular, but it’s all going on behind the scenes. I’ve explored the implications in many financial war games and other meetings as I’ve described in my books. I’m also on the Board of Advisors of the Center for Sanctions and Illicit Finance, which is the leading think tank on this subject. I meet with others who are expert in this area, including current and former government officials. I’ve warned the Pentagon and the Treasury Department about this threat for years. But the message has yet to sink in. The U.S. is still unprepared for this coming strategic alternative to dollar dominance. Meanwhile, U.S. trade sanctions on China, Russia and Europe are just beginning to bite. Trump’s new sanctions on Iran may be the last straw in the world’s willingness to tolerate what is perceived as U.S. bullying through the use of dollar-based sanctions. These headwinds are illustrated in the chart below. This shows the customers for oil exported by Iran. 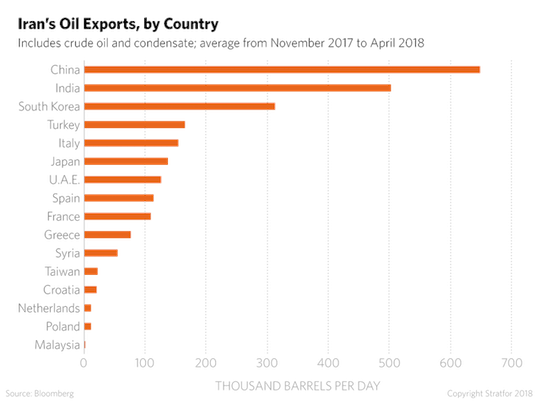 China is Iran’s largest oil customer by a wide margin. China’s need for imported oil is huge and Iran’s need for hard currency from its oil exports is existential. If the U.S. makes it impossible for Iran to pay or receive dollars or other hard currencies for its oil exports and machinery imports, Iran will have to resort to other payment channels. China would be willing to pay Iran in yuan, but Iran’s appetite for yuan is limited. As mentioned above, an obvious solution is for Iran and China to settle their balance of payments accounts in gold. Trump’s sanctions on Iran are a double-whammy. On the one hand, they impede global trade and growth; especially in Europe where growth was already slowing down before the sanctions. On the other hand, the Axis of Gold will create enormous demand for physical gold as an alternative to dollar payments vulnerable to U.S. sanctions. At the same time, the Axis of Gold creates huge embedded demand for gold as the Axis nations build out an alternative to the dollar payments system. But right now gold mining output is flat, western central bank sales of gold have ceased, and acquisition of gold by the Axis is increasing. That will cause the Fed to reverse course and pause in their path of rate hikes. The pause will come possibly in September, and almost certainly by December. The perception of the Fed flipping from tightening to ease will remove a major headwind to higher gold prices and create a tailwind. Future Fed easing combined with strong demand for physical gold will result in much higher gold prices by year end. The next few months could still be a bumpy ride for gold, but late summer and fall look promising for much a push to $1,400 per ounce or higher. Last week’s drawdown in gold prices should be seen for what it is, a temporary reversal in a new bull market. The current gold price of about $1,300 per ounce is a classic “buy-the-dips” opportunity that won’t come again soon. But before long it may be too late for investors to benefit because the ready supply of physical gold will be gone. The time to take a position is now. The days of dollar dominance are numbered. The process won’t happen overnight, but the signs all point in one direction.